I recently cleaned out my entire closet so my wardrobe is a bit on the lighter side (more about this soon), which is such an immensely satisfying feeling, but at times I feel as if I'm living in my "Cool Girl" summer uniform. In the novel Gone Girl Gillian Flynn wrote about the idea of a "Cool Girl" but my "Cool Girl" summer uniform is not really about being brilliant and funny. It's literally about keeping cool in this 90 degree heat, mentally and physically in a comfortable yet stylish way. My "Cool Girl" uniform rotates off a few key pieces. Basic tees from H&M in whites, grays, and blacks. High waisted shorts from J. Crew. Espadrilles from Soludos or Madden Girl Brando Sandals. I had thought about my uniform before summer started eying these espadrilles from Urban Outfitters, and cotton t-shirts from H&M. 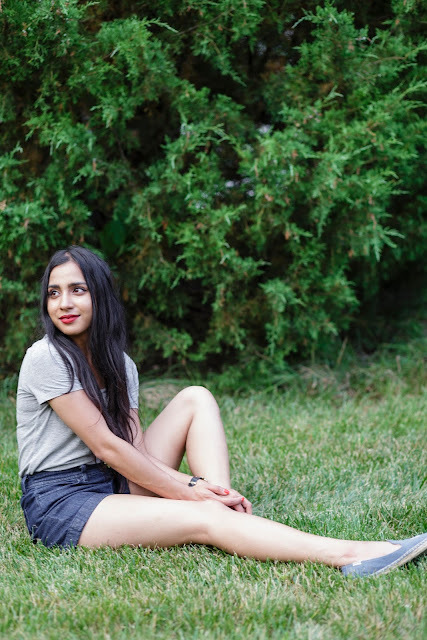 I had contemplated getting lace up flats for summer, but thought espadrilles suited me and my style better. How could I say no to such Parisienne shoes? Interning next to J.Crew has also become pretty dangerous for my wallet but I saved big on these side-zip denim shorts. They were originally $65 (now on sale $29.99?!?!) but they stacked my student discount 15% + 40% off on these shorts for me so I ended up shelling out about $30 instead. To mix it up and keep my uniform fresh other than these espadrilles, I'd add fun sunglasses or switch it up with a different style purse. Maybe choose a different bright nail polish too! I'm wearing OPI Brights I Stop For Red. I love this red, it reminded me of one of my favourite bright red polishes, Nicole by OPI's Kourt is Ready for a Pedi. Hope everyone is staying cool! What are your plans for July? I love your espadrilles !!! Those shoes are so adorable! I think interning by J.Crew would be a danger to most wallets. Haha. I live outside of NYC and its been so hot and humid lately. I'm more of a fall girl so I'm just trying to be as comfortable as possible. It's so dangerous M! I know how that feels! I was just in NYC and it was so nice for the summer, surprisingly! I love your "cool girl" uniform and I'm so with you on literally trying to stay cool. I saw those flats on your Instagram and fell in love--they are so adorable! I may need to go find a pair myself! Thanks Mme! Yes! You need them! So simple, yet so chic! Love your style! Those shoes are everything! Perfect with red lipstick. This is such a easy breezy yet very chic look, love it! Those slip ons are so cute! Those shoes have been on my wish list for so long. 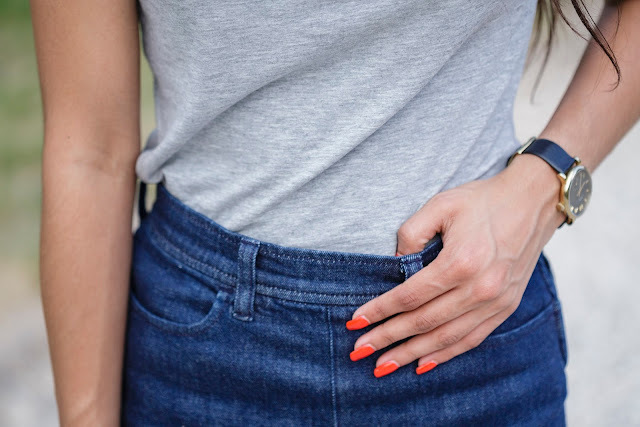 Actually any pair of Soludos :) Love the concept for this post - your summer uniform. I'm totally in need of a closet cleaning. I definitely feel like it not only clears the closet, but your mind a bit by having less clutter. Soul sisters! Thanks lady! I understand the pain of closet cleaning, so stressful but relieving! Love those super cute espadrilles, lady! You are such a doll. Perfect summer look babe. Thanks for the inspiration! 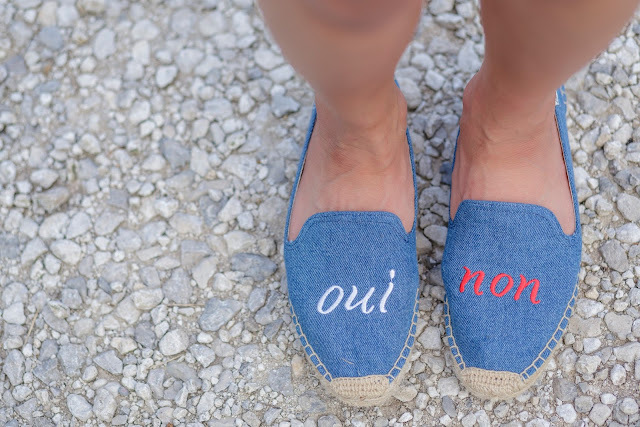 Your espadrilles are so cute!